Lewis Melican has been named to make his debut on Saturday night at the SCG. Sydney defender Lewis Melican will become the Swans’ sixth debutant for the season when he lines up in Sydney Derby XII on Saturday night. The 20-year-old has been selected in the side to take on cross-town rivals, the GWS Giants, in Saturday night’s huge clash at the SCG. 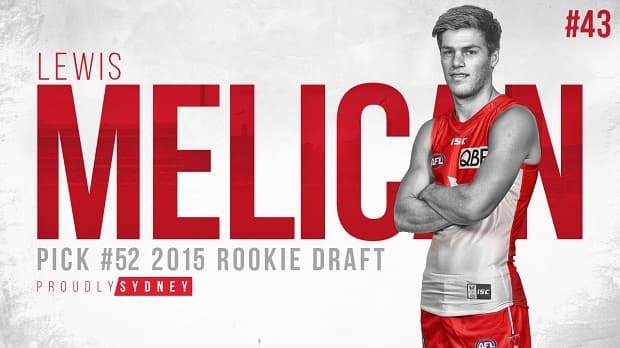 Recruited from Birregurra with pick 52 in the 2015 rookie draft, Melican was elevated to the senior list last week after an impressive pre-season. Now in his third season at the Swans, the versatile defender is looking forward to the opportunity. “I am pretty excited, that is the main feeling at the moment but hopefully the nerves will be gone by Saturday night,” Melican said. “I have had a few injuries in my time which is a bit annoying in such a short career. Melican credited NEAFL coach and former premiership defender Rhyce Shaw with being a ‘massive help’ over the past few seasons. He is now set to become the sixth Swan to run out for their debut this season. “It is good to see that you are not just one in and one out sort of thing,” he said. Melican joins Will Hayward, Oliver Florent, Jordan Dawson, Nic Newman and Robbie Fox to debut this season. It now means the Swans have played 13 debutants in the last 27 home and away matches, dating back to Round 1, 2016.